If you were walking down the street and ran into a pixelated 8-bit figure, what would you do? Meet Gary and his twin, Gary. One Gary is normal, but the other has a debilitating disease, famicom pixelosis - colloquially known as "8-Bit Syndrome." The rare condition means that Gary will forever look like a blocky, pixelated rendition of his true self, bound to a world without anti-aliasing or normal-mapping. Tragic, isn't it? Okay, I just made that last part up. Sorry, guys. This is actually a costume made by Kiel Johnson and Klai Brown for an upcoming Toshiba commercial - and in fact, "he" is actually a "she," going by the person inside the suit. 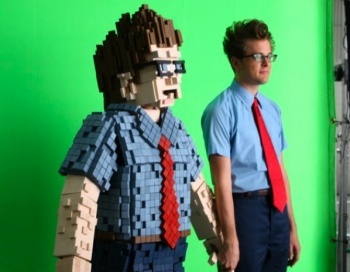 The Gary costume is made out of an "articulated cardboard suit structure" with joints that enable the wearer to actually move, covered in "pixels" cut from high-density foam. According to Johnson, he'd cut "around 4000 pixels" for the project. However, not all of them were used for Gary: "[We] are building two more characters for a video project." It may just be a costume, but if I see Gary walking down the street towards me, I'm going to cross to the other side. You never know if he's going to scarf down a mushroom and jump on your head.